Now you have to obtain the URL of your RSS Feed. In order to do that you have to create a menu item that will point to the category you created before. 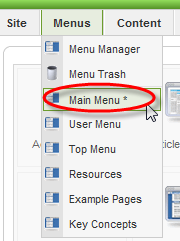 Now go to the "Menus" menu and click on a menu module, in our example "Main Menu". In our example you have to create a new menu item in the "Main Menu", by clicking on "New" on the upper right corner of the screen. 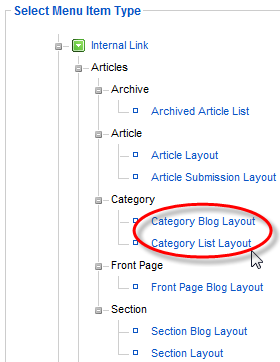 After that you have to choose a menu item type of either "Category Blog Layout" or "Category List Layout". Any of those would do just fine. Then on the next screen with the category's layout parameters, on the right hand side, select the category you created before for your news RSS Feed; in our example "MyNews/News Feed". A title for the menu item, in our example "My News Feed". An alias for the menu item, in our example "news-feed" (important if you use SEO!). Click on "No" so the menu item doesn't get published, unless you want the category containing your news Feed to be displayed on your website. Last click on "Apply" on the upper right corner. After clicking on "Apply", on the left hand side under the "Menu Item Details" and next to the "Link" you can see the URL to the category list/blog. Select the URL with your mouse and copy it; we're going to need this right away. Now let's see how your RSS Feed looks like! Paste the URL you just copied into the address bar of your browser. In our example the URL is: index.php?option=com_content&view=category&id=34. Now in front of the URL add Joomla's root address, here: http://www.valandis.de/; and finally at the end of the URL add this: &format=feed&type=rss. So this the whole URL of your Feed and you should take note of it, because you will need it soon. Now press enter and you must be seeing your news RSS Feed in your favourite browser. 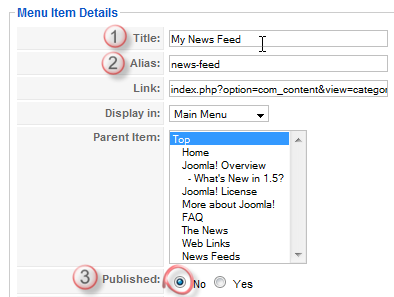 If you want to change the maximum number of articles which will be shown in the Feed, do the following: go to Joomla's administration control panel and click on "Global Configuration"; then on the first tab called "Site" and under "Site Settings" choose from the list "Feed length" the number of articles to show in your Feed(s).